On 19 April 2005, the College of Cardinals elected Joseph Ratzinger to follow Blessed Pope John Paul II on the Chair of St. Peter, and on that day he became Pope Benedict XVI. The day before his election to the papacy, Joseph Ratzinger, in his capacity as Dean of the College of Cardinals, celebrated a Mass “Pro Eligendo Romano Pontifice” (For Electing the Roman Pontiff) which was the last public event before the beginning of the Conclave in the Sistine Chapel. The dictatorship of relativism is the means by which those who hate Christianity will attempt to drive Christians from the public square, and this dictatorship, like all dictatorships, will almost certainly lead to fierce persecutions of those who will not submit to its illegitimate rule. I thought of that this week as I watched the absurd little storm surrounding a Southern fast food chain named Chick-fil-A. The man who founded the company is a serious Christian, and so is his son who now runs the company. The owners of Chick-fil-A have attempted from the modest beginnings of their enterprise to conduct business as Christian gentlemen; for example, their stores are never open on Sunday. It should come as no surprise, then, that these purveyors of delicious chicken sandwiches think that the word marriage means the lifelong bond of one man and one woman. But the mayors of Boston and Chicago, among others, were shocked (Shocked!) to learn that anyone alive today held such primitive, retrograde, bigoted and hateful notions, let alone that they had the temerity to admit such things in public. And that’s when the dictatorship of relativism bared its teeth. Thomas Menino and Rahm Emanuel both declared in public that they would oppose the Chick-fil-A restaurant chain expanding in their cities because the CEO had engaged in hate speech by suggesting that God’s eternal plan for marriage had something to do with the propagation of our species and that no legislature or judge could rearrange the natural order of things by declaring falsehood to be truth. For now, both of these ideologues have backed off from their overheated rhetoric, and one or two voices in the land have been raised in defense of the First Amendment. But the honest ferocity of the first response of Menino, Emanuel and their fellow travellers should not be forgotten: they wanted to put a Christian businessman out of business because he has “a clear faith based on the Creed of the Church” which they regard as fundamentalism. That is the dictatorship of relativism, and this is how it starts. Medjugorje is a village located (since the crack-up of Yugoslavia) in Bosnia and Herzegovina but populated almost totally by Croats. Since June 1981, a small group of villagers have claimed that the Blessed Virgin Mary regularly appears to them with messages from heaven, and despite the constant warnings of the local bishop that there is no basis to believe these claims, Medjugorje has become the third most visited pilgrimage site in Europe. Many Catholics of undoubted orthodoxy have been to Medjugorje and reported that they saw there only abundant signs of grace at work in the thousands of pilgrims who come there to pray. And yet ... and yet there are very serious counter-signs also at work in Medjugorje. The most serious of these counter-signs is the man who was once the spiritual director of the self-proclaimed visionaries and a champion of the alleged apparitions. His name is Tomislav Vlašić, and he was once a Franciscan priest. He is now a disgraced ex-Catholic and laicized former priest who has taken to shilling New Age nonsense to pay the bills. It turns out that one of the main promoters of belief in the alleged apparitions at Medjugorje is a heretic, a degenerate and probably a sociopath. In 1976, for example, he impregnated a Franciscan sister, whom he convinced to flee to Germany to hide the child. And this was the man who assisted the alleged seers in telling the world that they were receiving messages from the Mother of God. The partisans of the Medjugorje devotion invariably rebut all objections to these alleged apparitions with an appeal to the abundant spiritual fruits which come to those who make pilgrimage there. But this is not sufficient. Many Muslims and Mormons lead lives of great goodness, but their religions are false. Many Calvinists and Lutherans shame too many Catholics in their devotion to the Lord Jesus, their knowledge of Holy Scripture, and their holiness of life, but much of their doctrine is heretical and they live in separation from the Church of Christ fully and rightly ordered in history. The apparent fruit of holiness in the lives of pilgrims to Medjugorje is simply not evidence that the claims being made by the alleged seers are true, and until and unless the Holy Father makes a definitive judgment on this matter, the only certain guidance we have are the decrees of the Bishop of Mostar, the diocese in which Medjugorje is located. Two successive local bishops have asked that there be no pilgrimages to Medjugorje, and any Catholic who goes there to give credence to the claim of Marian apparitions is doing so against the legitimate authority of the local diocesan pastor. In March 2010, Pope Benedict XVI created a special commission to investigate everything about Medjugorje and submit a report to the Congregation for the Doctrine of the Faith. No further public statements about this matter have been made, so we must assume that the work of this commission is not yet complete. Until the Bishop of Rome makes a determination about this matter, no Catholic should promote devotion to the Blessed Virgin Mary under the presently illicit and presumptuous title of "Our Lady of Medjugorje". And beyond that, let us remember that the Christian faith cannot be based upon or guided by visions, locutions, apparitions, or so-called "private revelations" of any kind. When the Church approves locutions or apparitions and only when the Church approves them, these devotions can be useful to some of the faithful as an optional means of enriching their spiritual life, but our faith is given only to the Word of God -- the Word of God Eternal (God the Father's Only-begotten Son), the Word of God Incarnate (the Lord Jesus Christ), and the Word of God Written (the Holy Scriptures of the Old and New Testaments). The age of revelation ended with the death of the last Apostle, and no new word will be spoken to the human race because the final and full revelation of the Father's eternal plan of salvation has already been made in and by the Lord Jesus Christ. On July 20, 1969, Apollo 11 astronauts Neil Armstrong and Buzz Aldrin floated high above the lifeless surface of the moon in a boxy, four-legged landing vehicle named the Eagle. The radio hissed, and a voice called across space from Mission Control in Houston, a quarter of a million miles away: "You are go for powered descent." An engine fired, and the fragile craft began its downward journey. It would not go exactly as planned. Alarm signals flashed inside the tiny cabin, warning that Eagle's computer was overloaded. As the spacecraft hurtled toward the surface, engineers in Houston had seconds to decide whether to abort the mission. "Eagle, you are go for a landing," they directed. The astronauts continued their descent, but when Armstrong looked out the window to study the moon's surface, he realized that they were not where they should be. The computer was supposed to guide the Eagle to a smooth landing area. It had overshot the mark by four miles and was heading toward a crater of jagged boulders. Another warning light blinked. They were running out of landing fuel. Armstrong took command from the computer. The Eagle scooted over ridges and craters as he searched for a place to set down. The low-fuel signal flashed. There was no turning back now. A cloud of dust rose toward the Eagle. 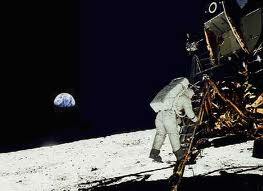 Silence ... and then Neil Armstrong's voice crackled to Earth across the gulf of space: "The Eagle has landed." Called to Communion is a splendid website run by converts to the Catholic Faith from the various parts of Reformed Christianity -- meaning Calvinists of one stripe or another. 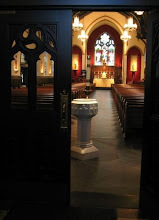 If you know Presbyterians with questions about Catholicism, please suggest that they visit www.calledtocommunion.com. The essays and commentary are always thoughtful, articulate, charitable, and directed to an exploration of serious theological matters without rancor.